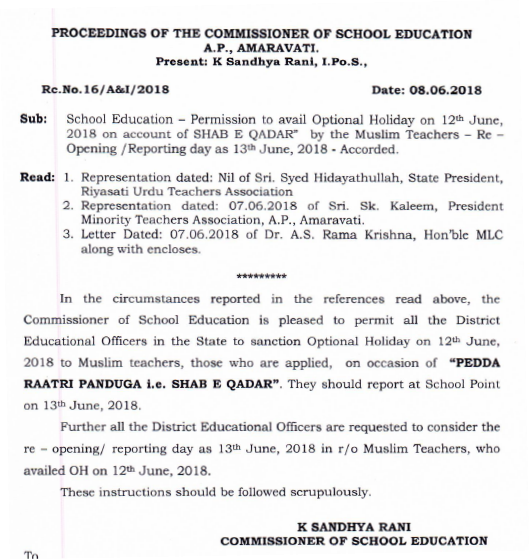 SHAB E QADAR Optional holiday Sanction for Muslim Teachers on 12th June Re Opening Day : Sanction Optional Holiday on 12th June, 2018 to Muslim teachers in AP Schools, those who are applied, on occasion of "PEDDA RAATRI PANDUGA i.e. SHAB E QADAR". They should report at School Point on 13th June, 2018. Sub : School Education - Permission to avail Optional Holiday on 12th June 2018 on account of SHAB E QADAR" by the Muslim Teachers - Re -Opening /Reporting day as 13th June, 2018 - Accorded. 2. Representation dated: 07.06.2018 of Sri. Sk. Kaleem, President Minority Teachers Association, A.P., Amaravati. SHAB E QADAR Optional holiday Sanction for Muslim Teachers on 12th June Re Opening Day. occasion of "PEDDA RAATRI PANDUGA -SHAB E QADAR.